Tooth loss impacts oral health in a number of ways. One of the most significant issues caused by tooth loss is jawbone loss. Restorative dentistry treatments are available to replace missing teeth and repair dental damage, restoring your dental function and appearance. Although restorative treatments can improve dental function, some treatments, including traditional bridges, won't prevent jawbone loss. To learn more about traditional bridges and jawbone loss, schedule a consultation with Wilmington, DE dentists Jeffrey J. Emmi or Laura Dougherty. Why Does Tooth Loss Lead to Loss of Jawbone? When an adult tooth is lost or removed, it is not uncommon for the jawbone to deteriorate. This is because the act of biting and chewing stimulates the jawbone. When a tooth is lost, the jawbone is no longer stimulated and will begin to disintegrate and dissolve. The speed at which the jawbone dissolves after tooth loss varies by individual, but most will begin to experience loss of jawbone within the first 18 months following tooth loss or extraction. Jawbone loss is a concern for your overall oral health because it can lead to a number of complications. Loss of jawbone can cause the remaining teeth to shift, potentially leading to misalignment, loose teeth, or even tooth loss. The appearance of the face may also change as the jaw line changes. Some people may experience wrinkling around the mouth or distortion of their facial features. Jaw issues, like temporomandibular joint disorder, may develop. Eating and speaking may also become difficult due to loss of jawbone. Traditional bridges are a common treatment for replacing missing teeth. 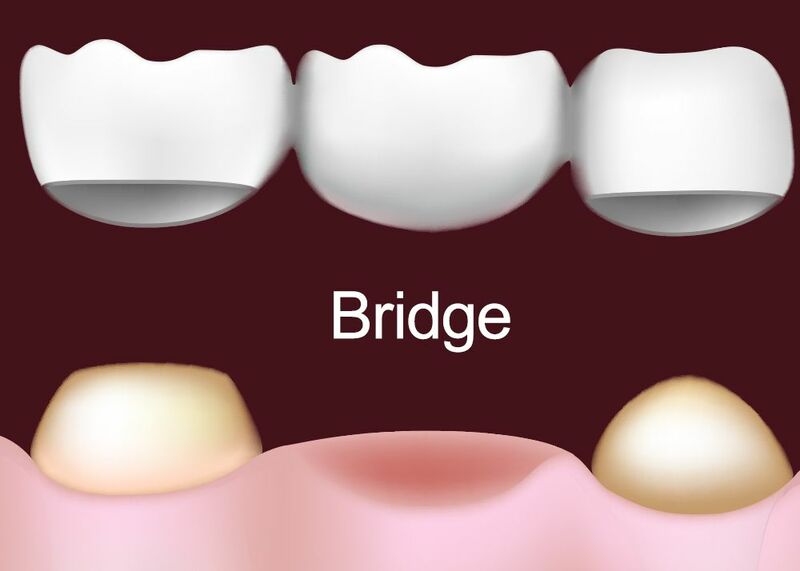 Traditional bridges consist of two dental crowns connected, or bridged, by one or two artificial teeth. The crowns are affixed to the teeth adjacent to the missing teeth, effectively restoring dental function and appearance. Although traditional bridges can restore missing teeth, traditional bridges do not prevent jawbone loss. Traditional bridges do not sufficiently stimulate the jawbone where the natural teeth are missing, which can result in jawbone loss. Tooth loss does not have to lead to the loss of jawbone. Restorative treatments are available to restore and preserve lost jawbone tissue. For those who have experienced jawbone loss, a bone graft may be performed to rebuild the missing bone structure. During a bone graft, bone tissue may be taken from the patient's own body, such as the hip, or a synthetic material may be used. The graft material is surgically attached to the jawbone. Over the next few months, the jawbone will begin to absorb the grafted material, effectively restoring the lost bone tissue. After a bone graft is performed, or before bone loss occurs, a dental implant may be placed to prevent bone loss. Dental implants are small, titanium posts that are surgically placed into the jawbone. Different dental restorations may be placed to restore one or more missing teeth. Dental crowns can be used to replace individual teeth, helping to stimulate the jawbone and prevent tissue loss. To learn more about your treatment options for tooth loss or any other dental needs, we encourage you to schedule a consultation with our team at Smile Solutions by Emmi Dental Associates.